Native to southwestern U.S., northern Mexico. 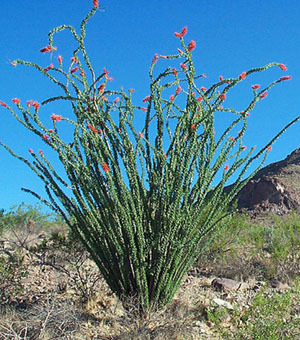 A large desert shrub with long, grooved, spiny canes. During each spring and after summer rains, canes sprout small, green leaves their whole length. Leaves remain several weeks before turning yellow and dropping. (Especially during hot, dry periods.) Spiky, red, tubular flowers appear on cane tips April through July. Slow growth rate. Produces a very stark and interesting silhouette.